The iPhone App that lets you fast forward with a press of one large button. 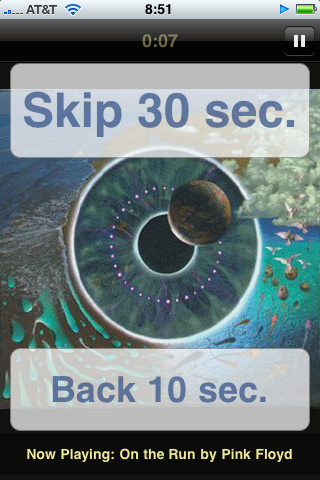 Skip Ahead available from Apple's iPhone App Store. Skip Ahead is an application for the iPhone and iPod Touch with a single key function - to provide the user with the ability to easily fast forward 30 seconds in the currently playing track. Are you listening to audiobooks? Podcasts? Music? Are you doing this while driving, running, excercising or doing any other activity that you would prefer to concentrate on? Have you ever tried to skip over that boring chapter intro, these tedious podcast commercials or that tiresome sax solo by aunt Elsie in the middle of your favorite song? If so, this app may be useful to you. The second large button is for stepping ten seconds back, useful when you want to hear something again or if you stepped a tad too far forward earlier. Report feedback, suggestions, comments etc to feedback(at)balooba.se. There is a good chance that your suggestions will be incorporated into future versions. There is currently no questions so it is not meaningful to compile a list of the most frequent. Please ask something and you might get published here. And get famous. Thanks to Pierre Orsander and Jelena P. Berglund for beta-testing. The program comes with no guarantees whatsoever. Using electronic devices while operating motor vehicles is not recommended and may be illegal in your town, city, state, country, principality, jurisdiction, territory, kingdom, neighborhood etc. Balooba Software is not responsible for anything negative that happens while using Skip Ahead including but limited to discomfort, bodily injury, property damage or other illness. By using Skip Ahead you agree not to press charges, pass on liability or in any shape or form blame Balooba Software or it's affiliates for anything in the world. Balooba Software develops and distributes software applications for the Macintosh and iPhone platforms. The products range from games to system utilities. Balooba Software's goal is to make software that are recognized by (hopefully) beautiful design, simple and straight-forward interface, are easy to learn and use, and always price-worthy.